Reusing bath towels and declining fresh bed sheets are typically as far as most hotels’ eco-consciousness goes, but for 1 Hotel Central Park, the second property in SH Group’s fledgling brand, things go way beyond that. 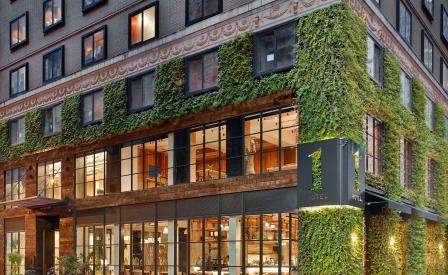 Housed in a former office building on 58th Street in Manhattan, 1 Hotel Central Park can be easily spotted from its urban surroundings by its lush, ivy-covered façade. Dressed by local firm AvroKo, in conjunction with the in-house design team, the natural theme continues past its wrought, reclaimed wood doors (made from 16,000 fallen branches) and permeates each of the hotel’s 18 floors, which are clad in materials ranging from brick and stone to penny nails and acorns. Each of the rooms is an extension of this natural haven, with glass Napa-style paned showers resembling greenhouses, natural hemp-blend mattresses to relax on and window seats offering guests a cosy place to enjoy the Central Park views. In place of the ubiquitous bottles of water, the hotel has installed taps, sinks and showers with Triple Clear Water filters to increase its efficiency. It’s also taken a paperless approach with bedside blackboards for jotting down notes, tablet devices preloaded with newspapers and periodicals and an app to guide guests through all the amenities in the room. The hotel’s signature restaurant Jams, helmed by chef Jonathan Wexman, takes a similar stance, with a focus on seasonal and organic fresh market produce.